If you are curious about how it’s done, please watch the video above, recorded at a recent Direct Engineering Assistance workshop at the Infectious Diseases Institute of Uganda. 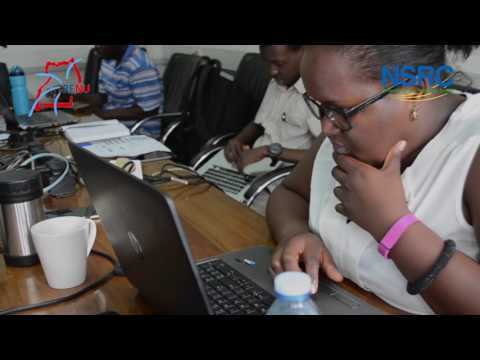 Here, the Ugandan research and education network RENU and NSRC worked together to design a scalable network for the centre. NSRC, established in 1989 and based at the University of Oregon, consists of about 30 part or full time employees with expertise in establishing networks in areas with shaky e-infrastructures. Originally established to provide access to the Internet to American researchers working abroad in bandwidth deprived areas, NRSC now has a much broader focus. The organisation is working to connect new countries, new networks and new people to the global research and education network fabric, extending the benefits of high-end science and eliminating obstacles to cross-border research collaboration. NSRC education and training activities are going on in various parts of the world. The calendar for 2016 and 17 lists workshops in Bhutan, South Korea, Vietnam, Costa Rica, Fiji, Senegal, and many other countries. Looking back at past NSRC achievements, it has provided technical assistance enabling “first ping” to many countries, among them Peru, Egypt, Sri Lanka, Tanzania, and Kenya. Originally established through a grant from the American National Science Foundation, NSRC is now privately financed by donations from individuals, foundations, and private companies like The Rockefeller Foundation, Google, AT&T Labs, and the American Organisation for the Advancement of Science. And if you think that the work of the NSRC would soon be finished, as all countries on the planet are connected, sadly you are wrong. The connectivity gap between the highly developed countries and the rest of the world is widening, so there is still very much to do.